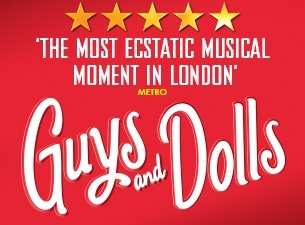 Don’t miss the "scintillating revival" (Financial Times) of Guys and Dolls this Christmas as the highly acclaimed Chichester Festival Theatre production heads to the West End for a strictly limited run. Nathan Detroit is desperate: he needs money for an illegal dice game, and he needs it fast. Not to mention a 14 year engagement with night-club singer Miss Adelaide whose patience is finally running out. Enter notorious gambler, Sky Masterson, a guy who can never turn down a bet, and straight-laced missionary Sarah Brown, a doll with a heart of ice. The wager: Sky has to romance Sarah by taking her to Havana for dinner and in return he’ll provide a dozen "sinners" for Sarah’s mission. Surely this is one bet Nathan absolutely can't lose? The sizzling New York tale of gamblers, gangsters and nightclub singers will leave you "walking on air" (Daily Telegraph) with a glorious evening featuring some of Broadway’s greatest show stopping tunes, including Luck be a Lady, Sit Down You're Rockin' the Boat and My Time of Day. Along with dazzling choreography by world-renowned Cuban ballet star Carlos Acosta and Andrew Wright (Singin’ in the Rain and Barnum); direction from the celebrated New Yorker, Gordon Greenberg, Guys and Dolls is one feel-good show you won’t want to miss.